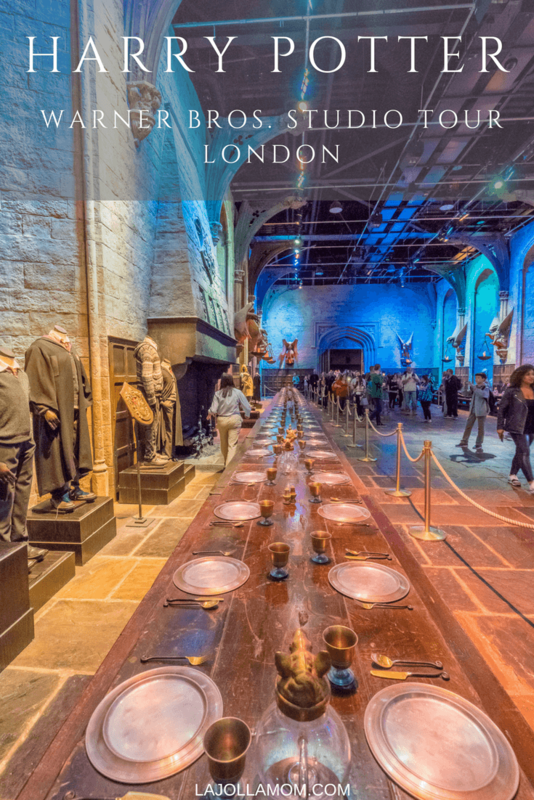 A mandatory London attraction for Harry Potter fans is the Warner Bros. Studio Tour London. After visiting this magnificent tribute to the people, costumes, pops, animals and sets that brought J.K. Rowling’s books to life, I now also understand why people, including my daughter, become overwhelmed by emotion upon stepping inside. Here you’ll find photos to showcase a little of what it’s like and my best advice so that you can maximize your time there. We definitely could have stayed a lot longer than we did. And, finding tickets on specific dates can be challenging so I’ll tell you how we bought ours. What Is the Warner Bros. Studio Tour London? Warner Bros. 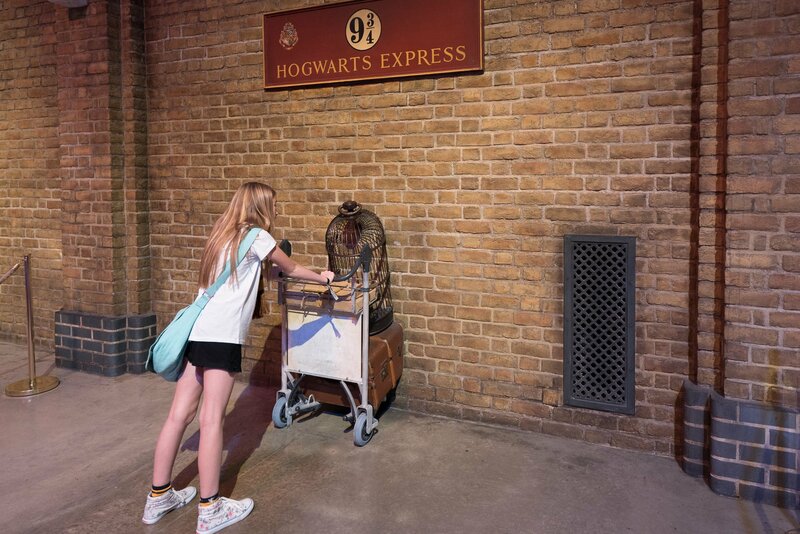 Studio Tour London is in Leavesden, about about an hour’s drive or 20-minute train ride away from London. More details on how best to get there are below. It is by far one the best things to do in London with kids though plenty of adults seek out the experience, too. Emma Watson, Daniel Radcliffe and Rupert Grant will tell you in the introductory video that they spent 10 years of their lives working and studying here while filming. The cast and crew became like family to them. It’s quite poignant as they were only kids at the time. Visitors walk through the various Warner Bros. 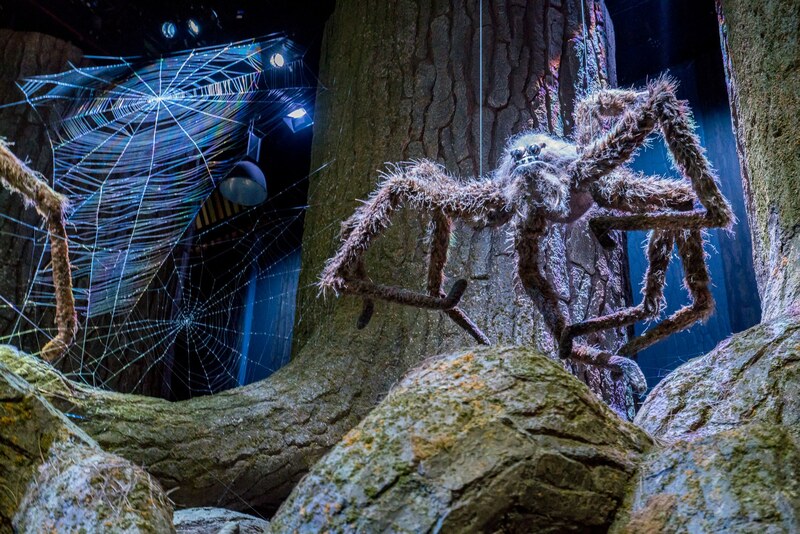 Studio Tour London exhibits that tell the story of how the films were made. After learning more about J.K.Rowling’s extreme attention to detail, I have a new appreciation for the movies. I can’t wait to watch them all again. By the time our tour bus arrived and our tickets were distributed, a queue to enter had formed. 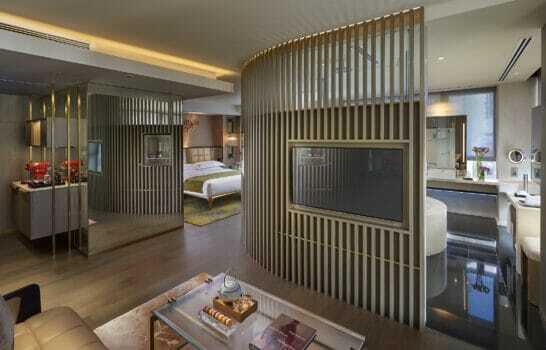 Kids are handed a passport full of golden snitches to find and other fun activities. But, my daughter and her friends were so blown away by the exhibits that they actually forgot to use the passport. However, be sure to pick one up in case your kids may enjoy it. Large groups of maybe 100 (that’s a guess) enter the studio exhibits at a time. After queuing in the studio lobby, the first stop is a room where a staff member gives an overview of the Warner Bros. Studios Tour London, some rules (it is one-way so no backtracking), and played short movie clips to drum up excitement about what’s to come. 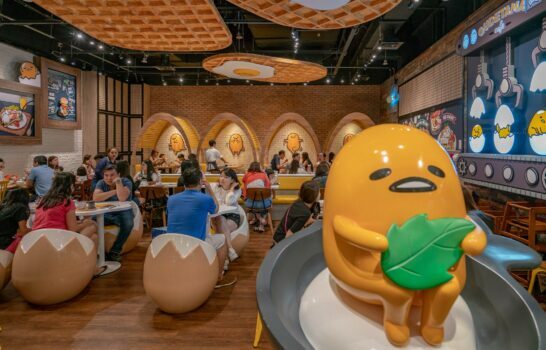 Then, doors open to the next room where the aforementioned maybe 5-minute video is played where star actors share tidbits about their spent time at the studio. Try to get seats in the front row for this movie. 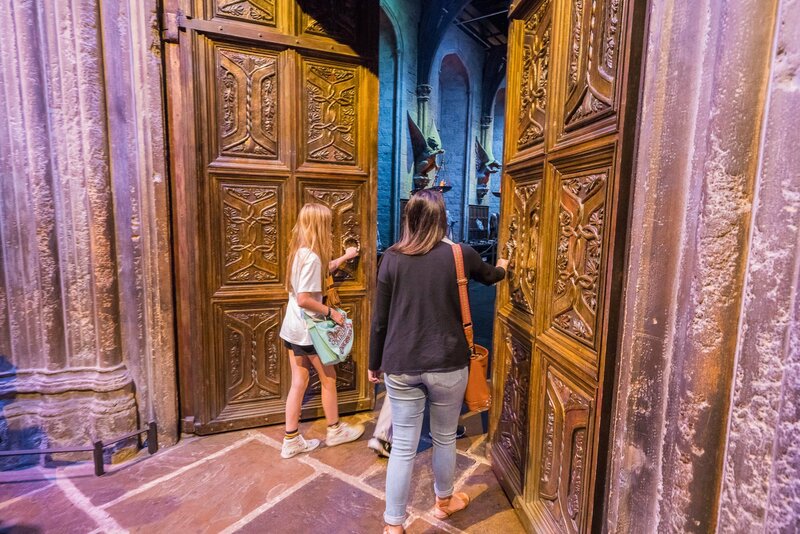 Once it’s over and a staff member appears, visitors exit the theater through massive doors leading to the Great Hall. And, two visitors have the privilege of opening these doors. Typically, whomever is celebrating a birthday will have the honor but no one in our group claimed it. So my daughter, ever the Harry Potter fan, basically lucked out. 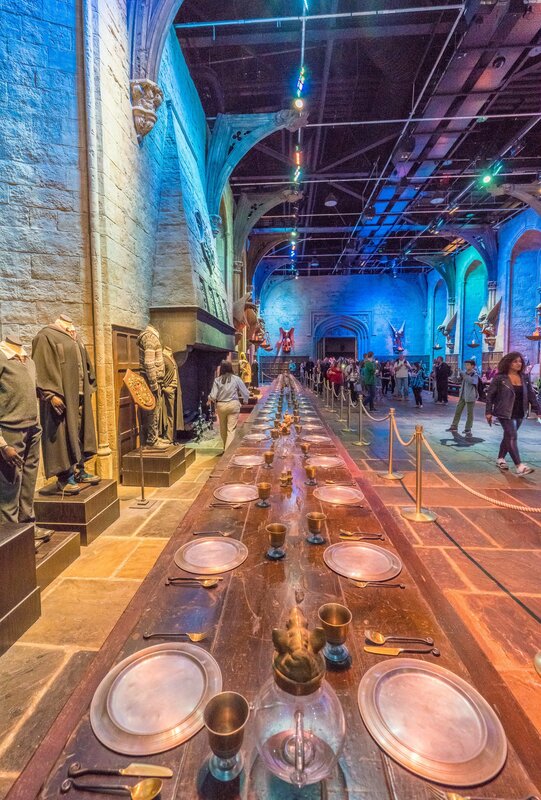 The Great Hall is truly amazing. So many details. 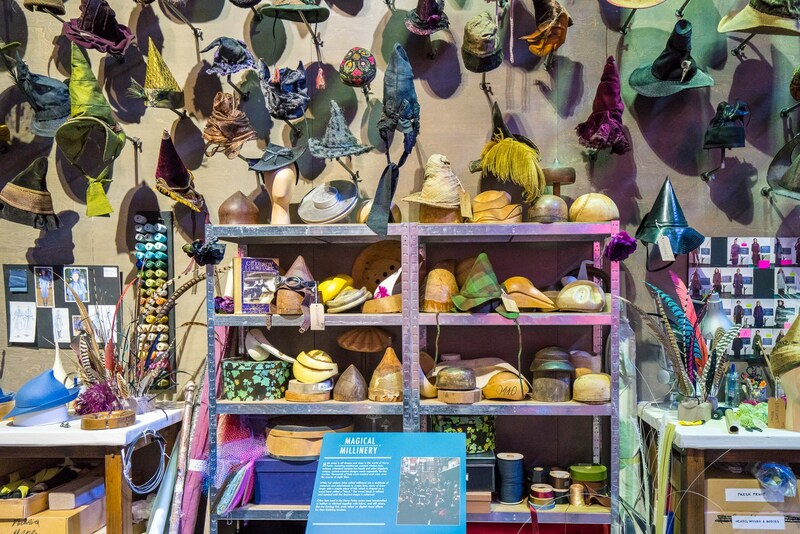 Surrounding it during the time of our visit were a myriad of costumes that were a part of the temporary “Wizarding Costumes” exhibit. You’re allowed just a few minutes to gawk at everything from the dishes to the light fixtures in this room until the next group is let in. The good news is that, now, you’re free to explore the studio at your own pace (or at a limited pace if your tour bus is leaving at a certain time as ours was). 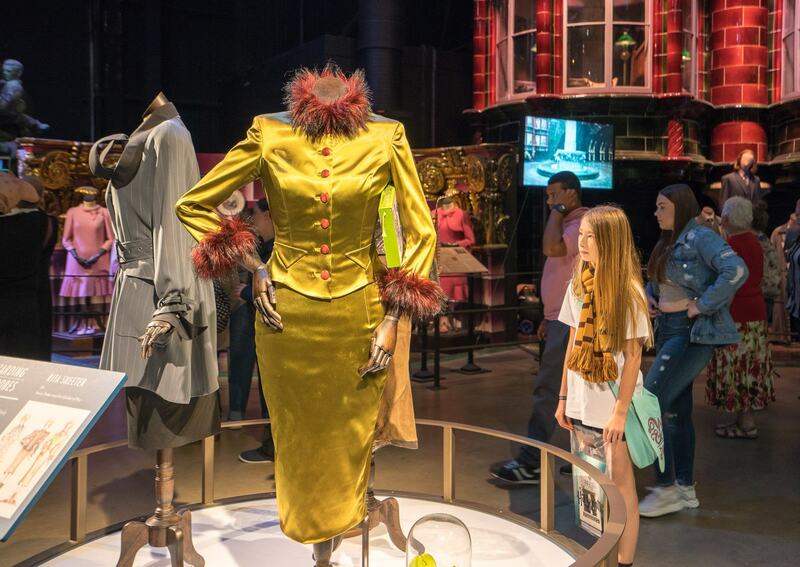 We saw Dolores Umbridge’s smoldering pink suit. We learned how they drug Harry Potter’s leather jacket behind a car to get jus the right distressed look and how they did Bellatrix LeStrange’s makeup, to name just a few things that came next. 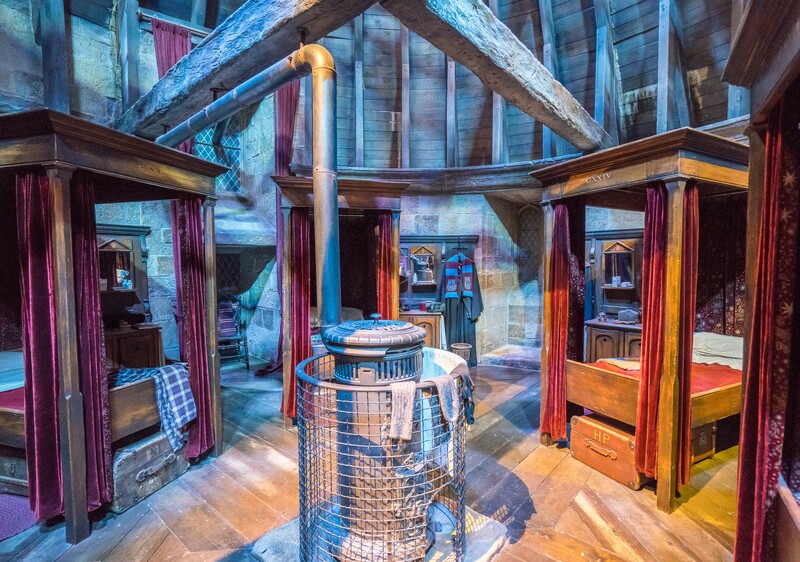 Then, there is the Gryffindor bedroom, the potions lab, Hagrid’s house, an exhibit dedicated to how the animal actors were trained and much, much more Harry Potter goodness. A highlight, however, that my daughter was looking forward to most is the quidditch broom simulators. 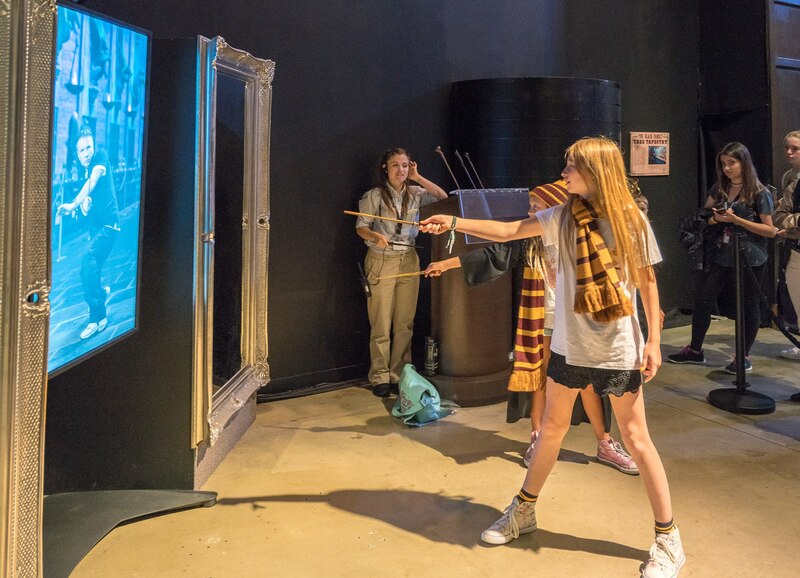 Visitors put on their house robe and can sit on a quidditch broom in front of a green screen. A staff member directs arm motions while the broom “flies” over Hogwarts, the Thames River and the City of London. It is quite cool but, of course, this video needs to be purchased or you can simply buy a photo (or both). Photos by you of the experience are prohibited here but we highly recommend you do this. 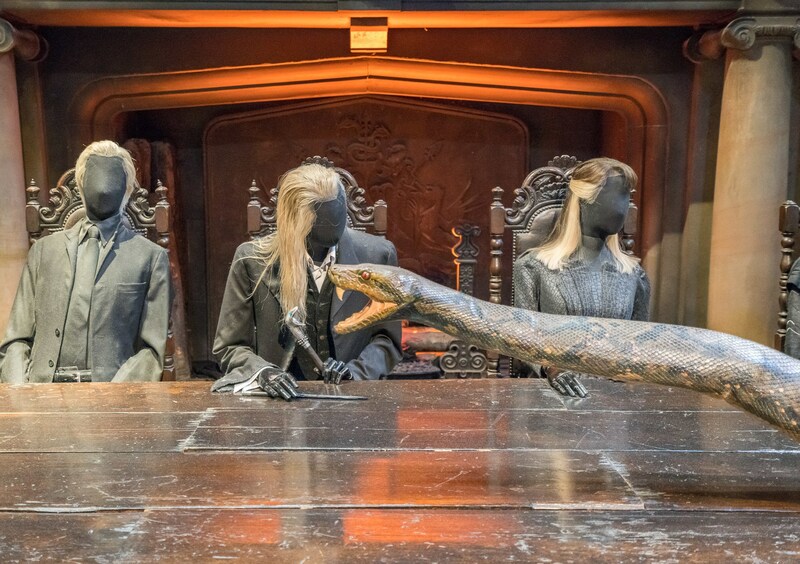 The next room has the scene where Nagini the snake slithers across the dining table to attack a Hogwarts teacher, the flying car Ron’s brothers used to rescue Harry from Privet Drive, and more. A staff member here also teaches how to properly use a wand. Then, it’s time to take a walk through the Forbidden Forest. The spiders are enormous and cool. The forest leads to platform 9 3/4 where you can take the famous trolley-running-into-the-wall photo. There are three trolleys to choose from that are lined up next to each other side-by-side. 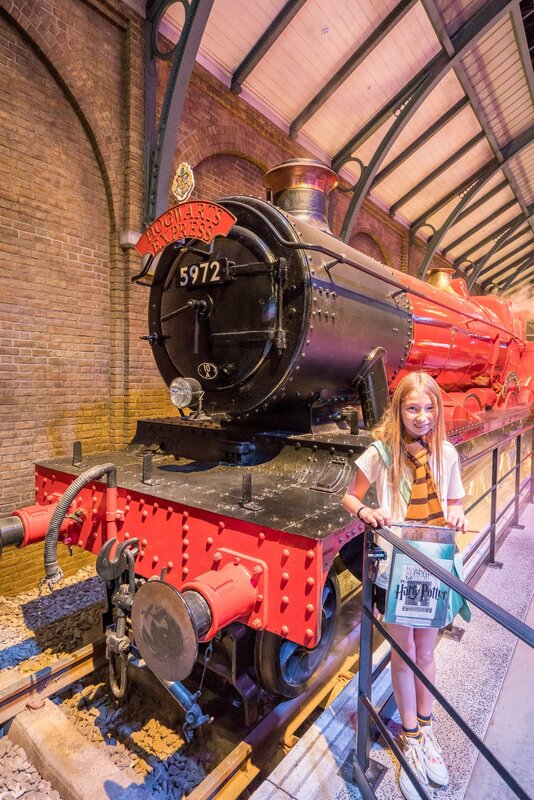 Visitors may queue to board the Hogwarts Express train. We did not as we were running out of time. The Backlot restaurant is your next stop. 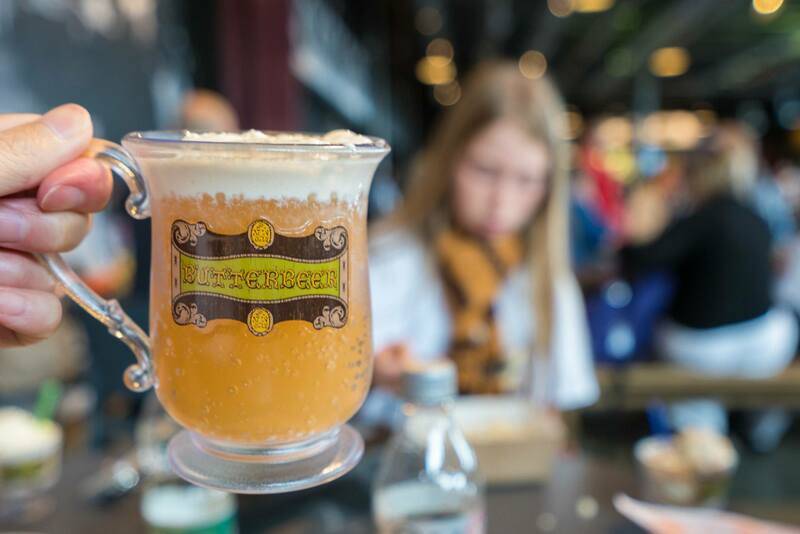 Here, they sell butterbeer, of course, in an optional souvenir cup. I did not see pumpkin juice but tell me if I just missed it. 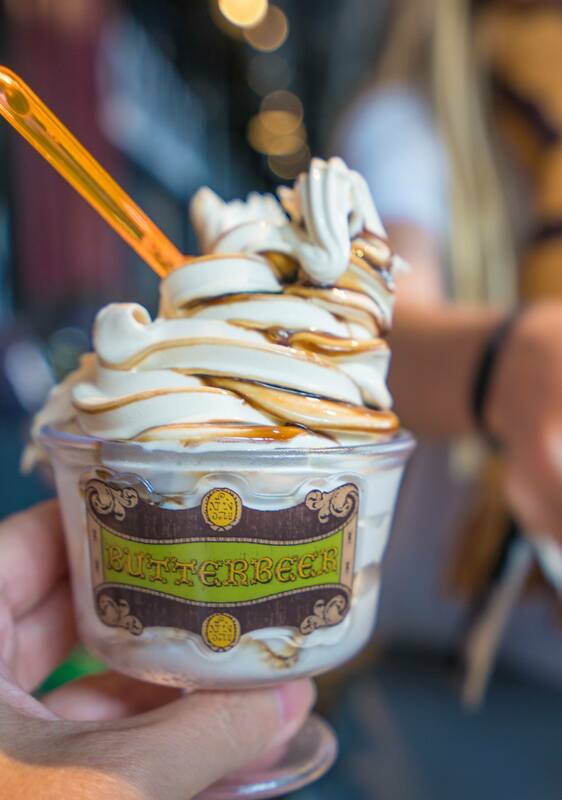 The glorious butterbeer ice cream is heavenly and also comes in an optional souvenir cup. Sadly, there isn’t any feast food but the sandwiches, salads, mac and cheese, burgers and more are perfectly fine fare for a quick lunch. 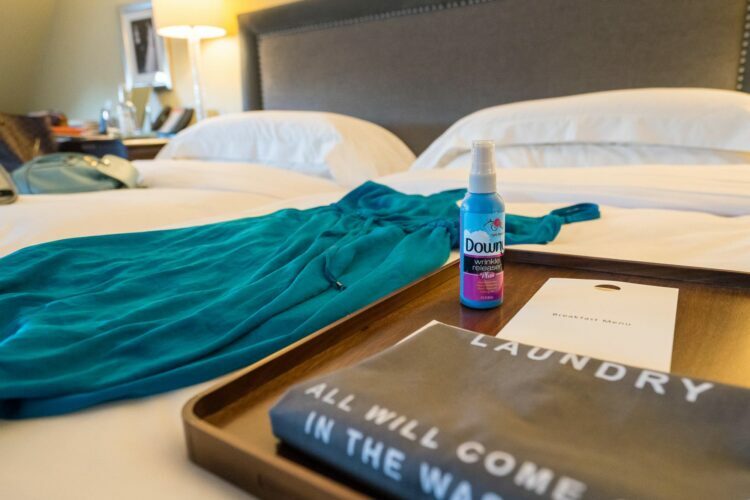 Because you’ll want to make it quick to avoid running out of time. 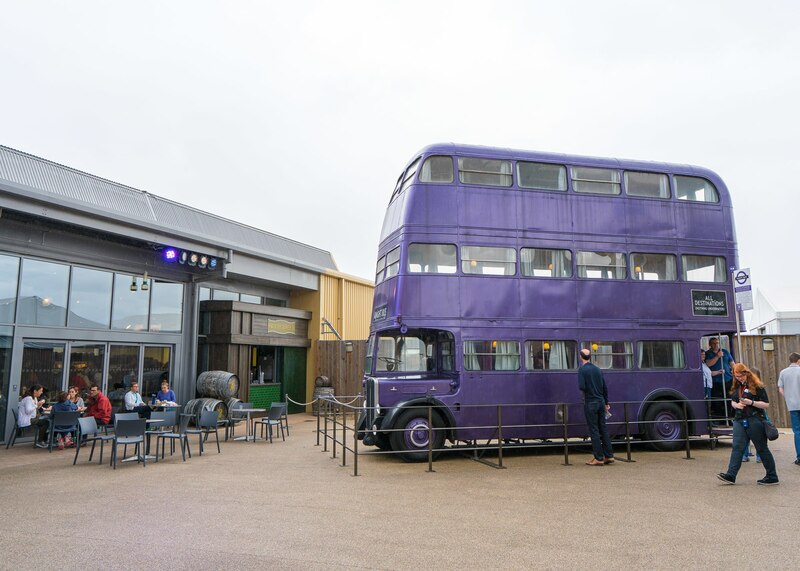 Outside of the Backlot restaurant is the Night Bus and you can walk inside 4 Privet Drive. We wished for more time in the props area and had to speed through. We barely had a chance to see Diagon Alley. 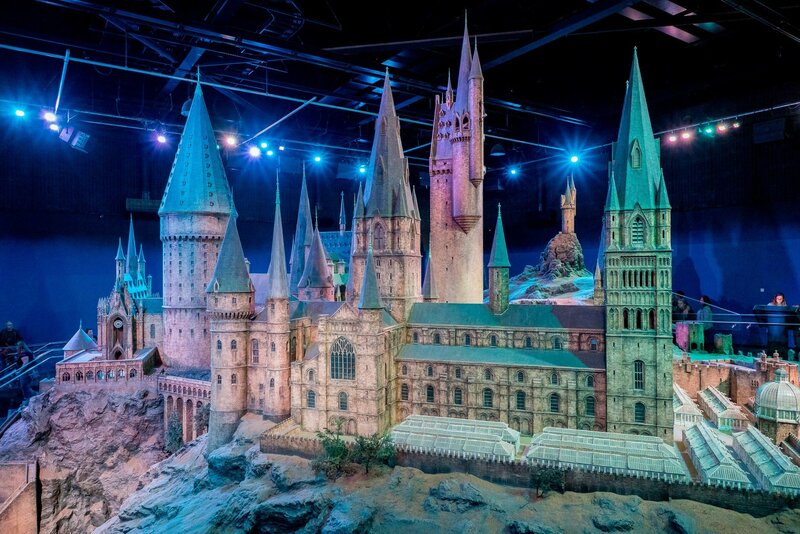 You’ll know that you’re at the end of the tour when you see this stunning model of Hogwarts. 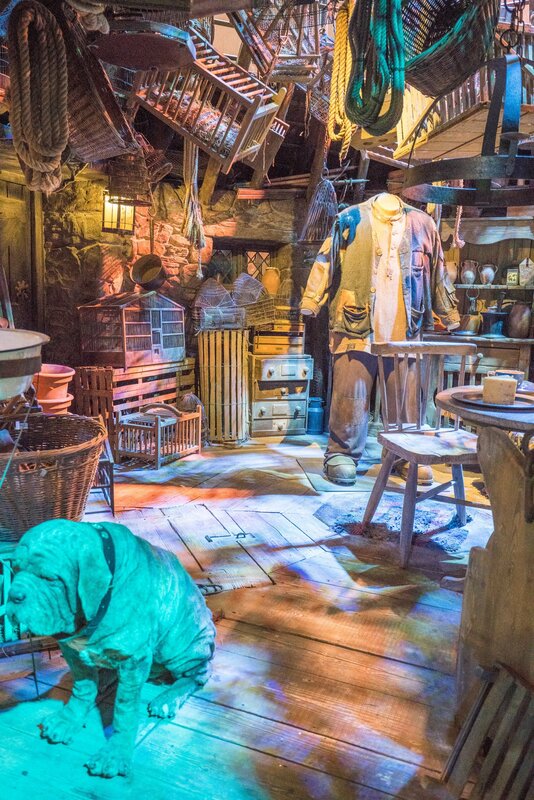 The next stop is the gift shop or you can reverse to see more of Diagon Alley and the props in this section. Licensed Harry Potter gear is obviously sold here. And, there is more of it than I’ve ever seen anywhere. I would honestly plan for 20-30 minutes to explore the gift shop alone. 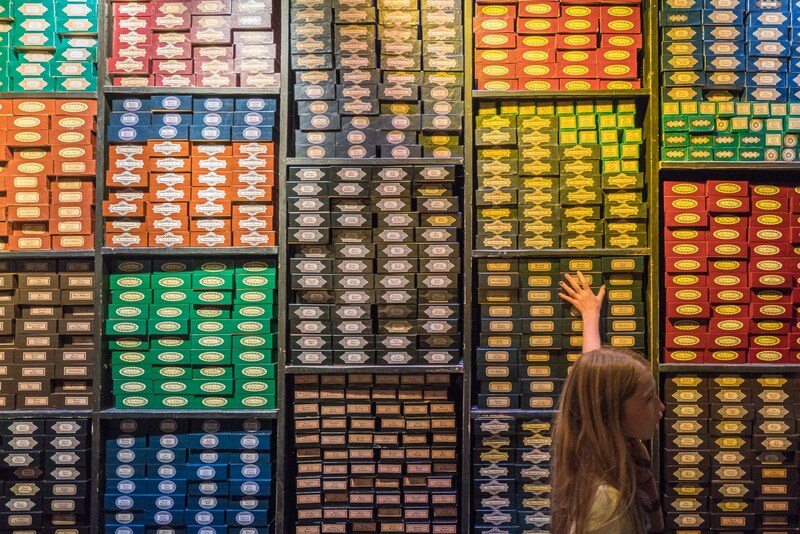 Wands are less expensive here, at Hamley’s and at the Platform 9 3/4 shop (ranging between 28 – 32 GBP) than they are at a place like Universal Studios, for those of us paying in US dollars. Hot tip: Buy your tickets in advance! They do sell out ahead of time. You can buy tickets directly through Warner Bros. Studio Tour London. These are the ones that tend to sell out the fastest. If you do this and are in a Central London hotel, take the train to Watford Junction from Euston station (about a 20-minute journey) which is also a tube stop. Then hop on the shuttle to the studio (cost is 2.50 GBP, cash). This is definitely what I would do next time as I’m comfortable with the trains (they’re easy), having lived in London. And, this allows you to go at your own pace. If the studio is sold out, your next best option is to buy a transportation and ticket bundle through a tour company. Or, this is a good option for people who would like fully-organized transportation. Truth be told, I was nervous about doing this but found myself scrambling for tickets several months in advance when we’d finally nailed down our London itinerary. The tour guide had to get off of the bus and pick up our tickets, leaving us to wait about 20-30 minutes on the bus, well after the studio had opened and other busses had disembarked. The line to enter the studio itself had grown to almost 30 minutes on top of that. We were limited to three hours inside the studio (including that 30-minute line to enter) which, for us, was not long enough. You could be delayed if other tour group members show up to the bus late (this thankfully wasn’t an issue for us). That being said, if this is the only way to take the Warner Bros. Studio Tour London, it is worth every penny and extra hassle. I did a lot of research and several of the most reputable companies include Golden Tours, Evan Evans and Premium Tours. We took the latter and it did work out very well. You can buy these tours through Viator. If you have the liberty of choosing your entry time, make it first thing in the morning. The reason is that a number of bus tours tend to arrive between 10:00 a.m. – 11:00 a.m. I suspect this is why our wait to get into the studio was longer than anticipated. Your ticket will be timed for entry within a 30-minute time slot. It’s imperative that you also arrive to the studio without delay. We could have used four hours, maybe even five to explore everything at a leisurely pace. My daughter is a really major Harry Potter fan though. 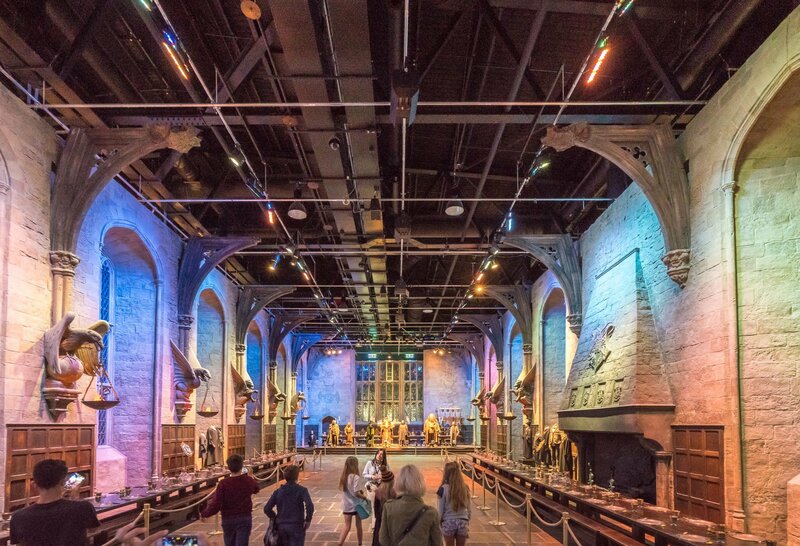 You don’t actually need to be a Harry Potter fan to enjoy a visit here. Those vaguely familiar or even unfamiliar with the movies can still appreciate the level of costume and special effects detail. 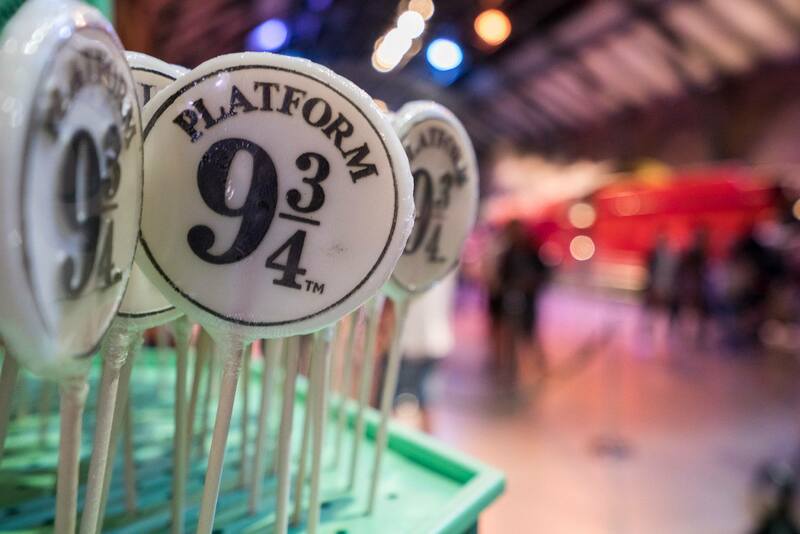 But if you do love Harry Potter, this is a bucket list destination for sure. It’s awesome and I didn’t even show you a quarter of it. 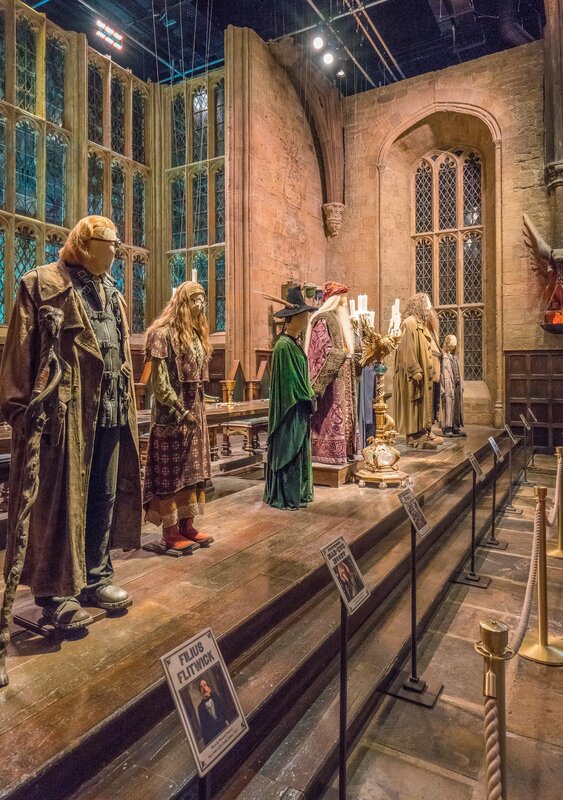 Warner Bros. Studios Tour London rotates exhibits. 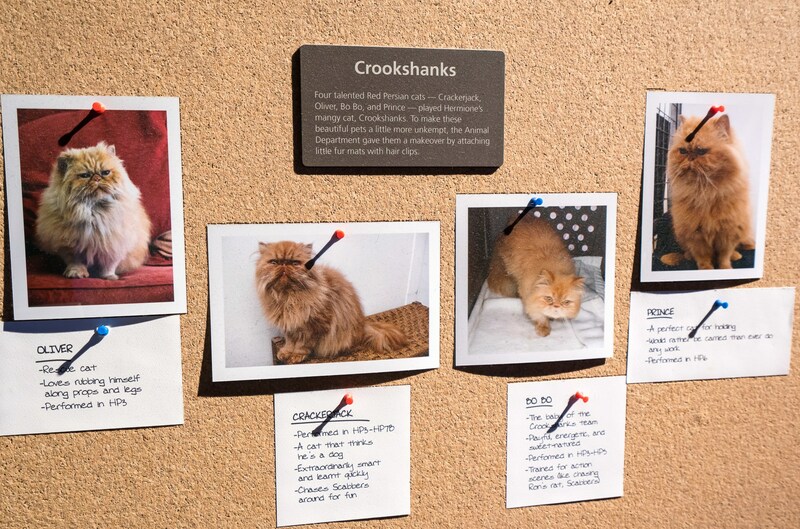 This fall, they’ll showcase a Dark Arts exhibit. Hogwarts in the Snow happens in winter and I hear it’s a must-see. This means it certainly is a London attraction to visit more than once because you’ll see something new. 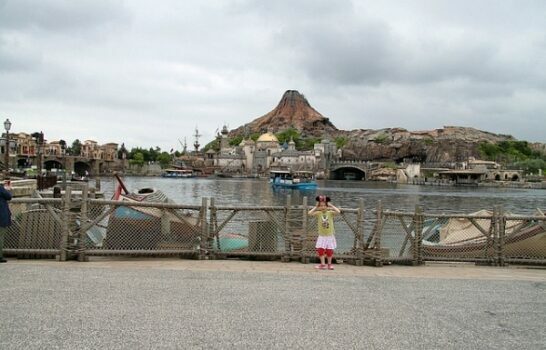 My daughter wants to go back as soon as possible actually. It is not an included attraction on The London Pass, but you may want to take a look at this pass for your other sightseeing. 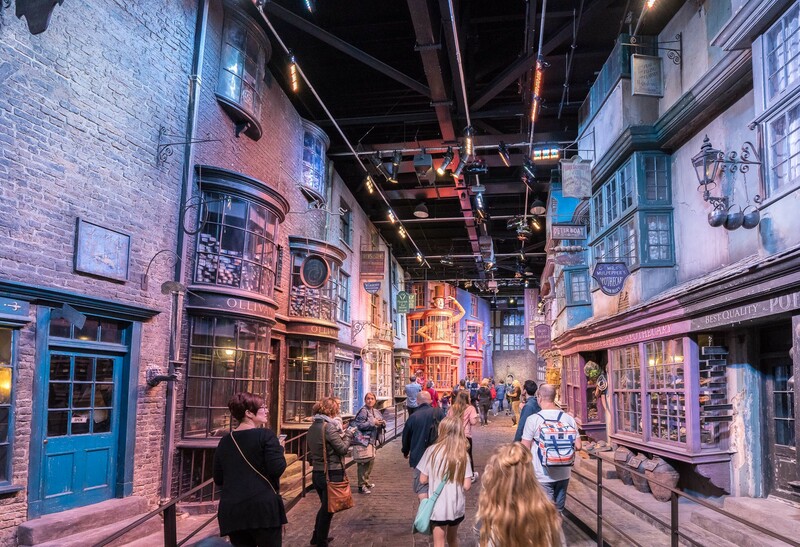 If you’ve visited Warner Bros. Studios Tour London, we’d love to hear your tips! We went on our own just last month… and we had a blast. 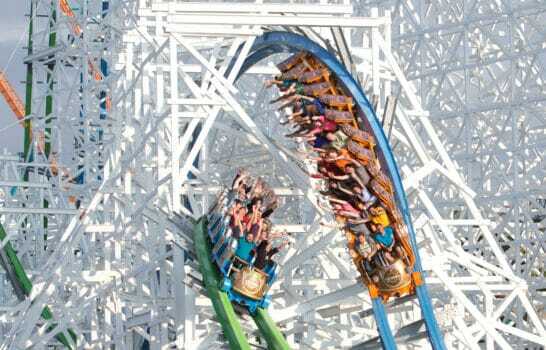 We spent 5 hours there and enjoyed every minute. The shuttle from the station to the studios is not complimentary. It is 2.50 pounds per person and must be paid cash. We booked our tickets in March for a July date and the morning times slots were already sold out. You need to book VERY early. Oh thanks. I was told it was free when we were at the studio but apparently that was wrong. Good to know that 5 hours was well-spent. I think we could have easily spend 5 hours there because it was a pity to be rushed.